This blog is just a hobby, I certainly don’t make any money from it. So it’s always nice to be invited on a food tour or to the odd restaurant now and again. But a painting evening, even with wine, I wasn’t sure about at all. And to be frank, I was a little nervous. But I needn’t be. This was without doubt one of the most fun evenings I’ve had in Barcelona. Looking for something different to do? Then Arte Bar Barcelona is it! 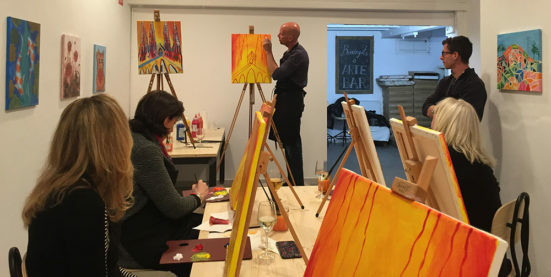 Co-owners Alisa Rosseter and Bruce Anderson (one of the coolest and loveliest couples you could hope to meet) opened Arte Bar in February 2017 with the aim of turning art into entertainment. 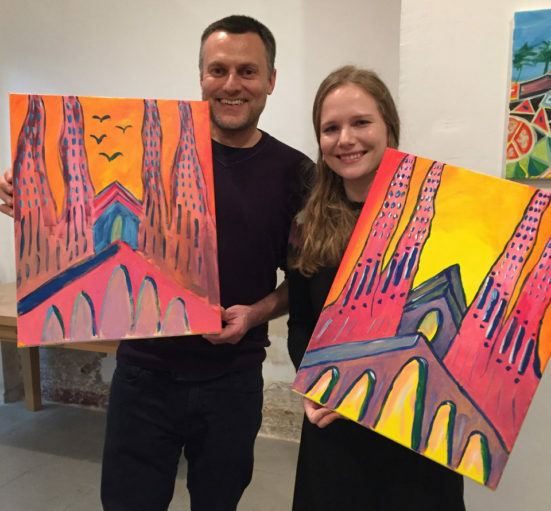 They offer ‘no-experience-required’ painting parties in their studio in Eixample (c/ Roger de Flor, 135). You can go on your own, as a couple, with friends, or as a whole group. Kids and teens events are in the pipeline too. You choose one of the featured paintings from their calendar, book your place, and simply turn up. You are provided with all the materials, an apron, and a handful of confidence if you need it. I needed two. You are plied with wine or beer throughout the evening if you so wish. And a selection of nibbles of the jamon and cheese variety is on offer. The 3 or 4 (it was probably more like 5 or 6) glasses of wine I had were extremely helpful in getting into the flow of it all. I can count the number of times I’ve held a paintbrush in the last 44 years on one hand. So my nervousness was warranted. If you ask me to draw a dog you will get something that is as far from anything canine as you can imagine. I have no idea about even the most basic drawing techniques. 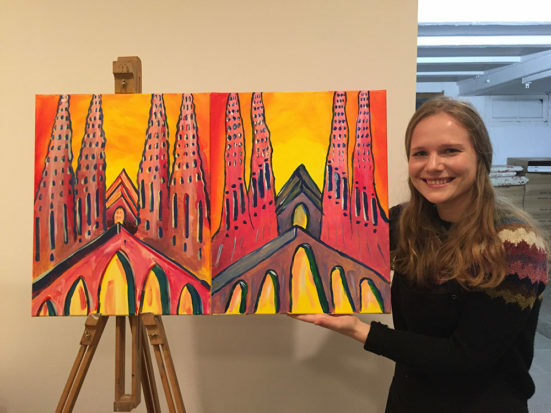 And the thought of painting the Sagrada Família filled me with nothing less than dread. But as I say, I had wine, so things were never going to be that bad. Or at least if they were, I had an excuse. 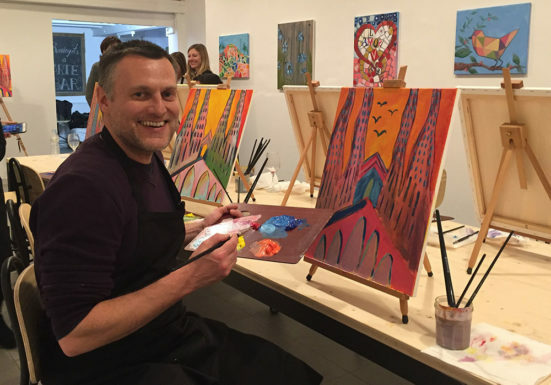 Bruce was our painting instructor for the evening and he expertly guides you every step of the way. Beginning with a blank canvas was as scary as I thought it would be. But a light yellow wash later and we were on our way. Step by step we built up the canvas layer by layer, Bruce at the front, guiding us through each stage on his own version. What with the wine and a few confidence-boosting comments from Alisa as she wandered around I was beginning to feel the essence of Dalí flow through me. For a while I actually thought I could paint, and it was quite wonderful. We took a break for a chat and some nibbles, and a nose at everyone’s efforts. And our canvases were hairdryered to speed things up ready for the next stage. And then on we went, until I had something that wasn’t actually that bad. I was even quite proud of myself. And this is the wonderful thing about the whole evening. Whether novice or accomplished, I guarantee the feeling of satisfaction you’ll get at the end will blow you away. And you’ve actually had fun and got a little bit tipsy at the same time! It’s a complete winner. The evening lasts 2 or 3 hours. And at the end of it you have a proper canvas to take home and, depending on the quality, hang in your lounge, bedroom, or toilet. Mine is in the bedroom. The fact that it isn’t in the cupboard is testament to Bruce and Alisa. I promise you, it will be a fantastic evening! The Sagrada Família is not the only option. As well as other Gaudí efforts there are more traditional subjects such as sunflowers, cactus, Koi carp, and jellyfish, and they are adding new ones all the time. When you look at people’s differing styles on their Facebook and Instagram accounts you begin to realise this really is something special they are offering. 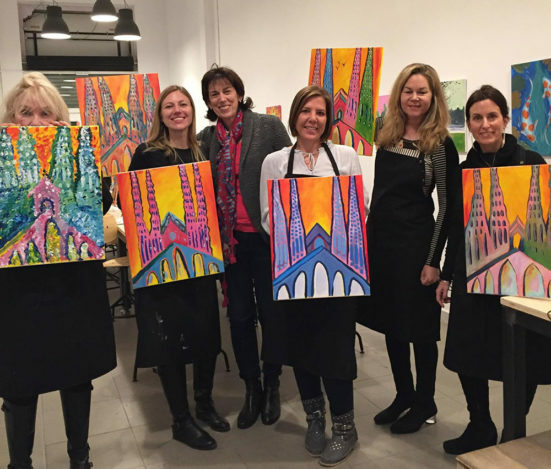 To book your place at the Arte Bar visit their website at artebar.es and go to the calendar to see what painting choices are available. The price is €30 which is an absolute bargain. You can also book the Arte Bar for private events. It is perfect for a corporate team-building event I would have thought. And follow them on Facebook and Instagram for further inspiration and encouragement. You can really see the joy on people’s faces! Have you been? Did you enjoy it? Let me know in the comments. Jess from Barcelona Blonde with her painting next to the instructors. Not bad Jess! Just came across your website and am enjoying immensely your articles, this one no exception.